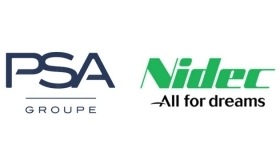 PARIS -- PSA Group and Japan's Nidec said they will invest 220 million euros ($261 million) in a joint venture to produce electric motors in France. The joint venture will design, develop, manufacture electric motors for PSA and other automakers, the companies said in a statement on Monday. The motors will be designed for full-electric, plug-in hybrid and mild-hybrid vehicles, the companies said. PSA envisages production capacity of 900,000 electric motors annually by 2022, according to a presentation by PSA executive Patrice Lucas. The motors will be fitted into Peugeot, Citroen and DS vehicles, as well as cars sold by the Opel and Vauxhall brands, which PSA bought from General Motors in August. PSA and Nidec said the market for automobile electric motors is expected to double to 45 billion euros by 2030. As global competition heats up to develop electric cars and automated driving functions, Nidec has said it wants to become a global auto parts supplier rivaling Robert Bosch and Denso. Its midterm strategic goal targets midterm automotive sales of 700 billion yen to 1 trillion (5.4 billion euros to 7.6 billion) in 2020, it said in the statement. Nidec manufactures motors for products ranging from hard disk drives to elevators and automobiles, and owns the U.S. Motors brand. The highly acquisitive company, which describes itself as specializing in "everything that spins and moves", has been snapping up companies in anticipation that new automotive technologies will result in a boom in the market. It announced last week it had bought driveXpert, which makes electronic control units for automobiles. Earlier this year, it acquired the motor and electric power generation businesses of France's Emerson Electric, and the drive business of Emerson Electric Co. of Britain. The transaction is subject to antitrust clearance and consultations with employee representatives. The joint venture's headquarters will be in Carrieres-sous-Poissy near Paris. Nidec will act via Nidec Leroy-Somer, the French electric motor company that it acquired in February 2017. As part of CEO Carlos Tavares' Push to Pass business plan, PSA plans that 80 percent of its models will have an electrified powertrain variant by 2023. Full-electric versions of the Peugeot 208 and upcoming DS 3 Crossback subcompact cars are planned in 2019 with a range of about 300 km (180 miles), executives told investors in September. The Peugeot 2008 small SUV will get a battery-powered option in 2020. Plug-in hybrid options will include compact crossovers built on the company’s EMP2 platform, starting with the DS 7 Crossback in 2019 and continuing with the Peugeot 5008 and Citroen C5 Aircross. The Peugeot 3008 and Opel/Vauxhall Grandland X small crossovers will also have plug-in hybrid options.